99 T R O P I C M A G A Z I N E POINT OF AMERICAS I • #1503 2BD/2BA Split Bedroom Plan Spectacular Beach and Intracoastal Views up to the Hillsboro Lighthouse. Sweeping terrace, great room, open kitchen and Luxe Master suite with lots of closets. 5-Star amenities include restaurant, guest hotel suites, 3 gyms, 2 pools, cabana service on the widest beach in Fort Lauderdale. Close to airport and highways. • $675,000 POINT OF AMERICAS I • #2308 2BD/2BA totally redone with impact glass Southern Ocean and boating exposure. • $875,000 POINT OF AMERICAS I • #1612 A RARE uPdATEd NORThEAST CORNER A REAL WOW, 2BD/2BA model featuring marble flooring, Gourmet open kitchen, gracious living spaces, oversized master suite and balcony. 5-star resort amenities including grand lobby, restaurant, fitness center, guest rooms, lush pools and cabanas on the widest and best beach in Fort Lauderdale. Watch the ships from the private beach or the tropically landscaped pool decks. Close to Las Olas, downtown and the airport. 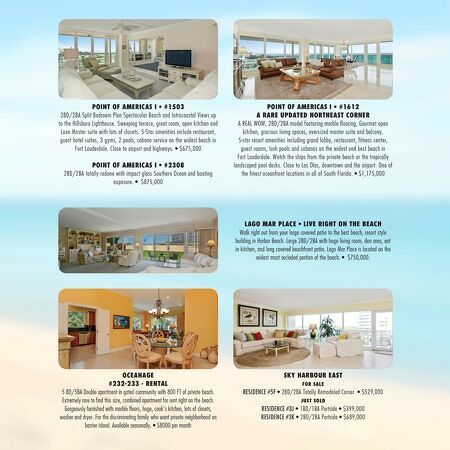 One of the finest oceanfront locations in all of South Florida. 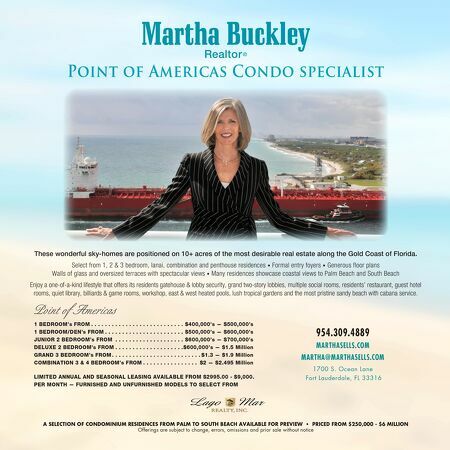 • $1,175,000 OCEANAgE #232-233 - RENTAl 5 BD/5BA Double apartment in gated community with 800 FT of private beach. Extremely rare to find this size, combined apartment for rent right on the beach. Gorgeously furnished with marble floors, huge, cook's kitchen, lots of closets, washer and dryer. For the discriminating family who want private neighborhood on barrier island. Available seasonally. • $8000 per month SKY hARBOuR EAST FOR SAlE RESIDENCE #5F • 2BD/2BA Totally Remodeled Corner • $529,000 JuST SOld RESIDENCE #3J • 1BD/1BA Portside • $399,000 RESIDENCE #3K • 2BD/2BA Portside • $689,000 lAgO MAR PlACE • lIVE RIghT ON ThE BEACh Walk right out from your large covered patio to the best beach, resort style building in Harbor Beach. Large 2BD/2BA with huge living room, den area, eat in kitchen, and long covered beachfront patio. Lago Mar Place is located on the widest most secluded portion of the beach. • $750,000.